Six Twenty Seven: What's for lunch? 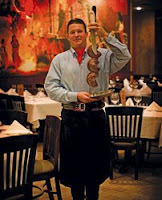 Offering a vast selection of choice cuts of meat, a Brazilian steakhouse is close to paradise for meat lovers. The recession doesn't have to take a toll on your taste buds...there is a smarter way to indulge your inner meat-demon without breaking the bank. Instead of dining for dinner when prices can run you close to $50/person...try opting for a lunch date instead. 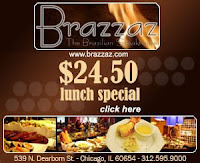 Yesterday I enjoyed lunch at Brazzaz Steakhouse and was pleasantly surprised. 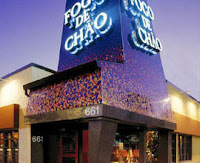 Though it's 2nd place to Fogo de Chao, Brazzaz boasted a nice selection of meats and an outstanding salad bar! For anyone looking to try out a Brazilian steakhouse I suggest going for lunch. 661 N. La Salle St.